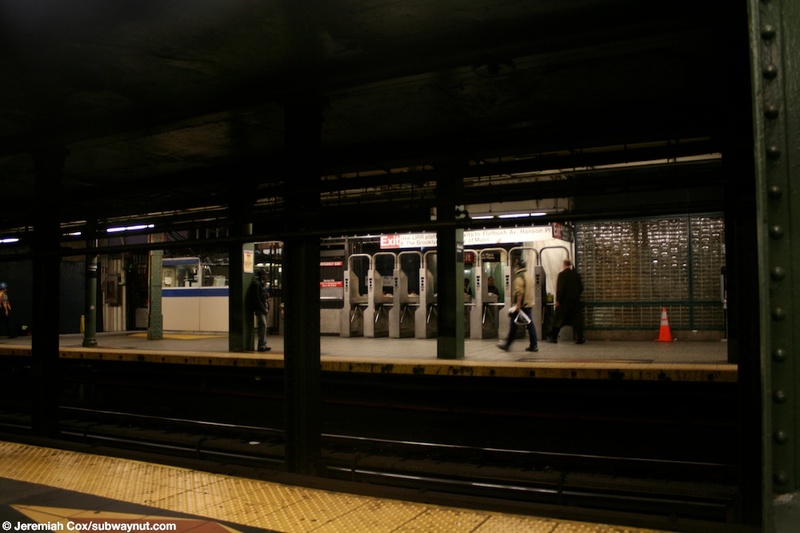 The IRT Station at Atlantic Avenue has the very unusual layout of Side Platform-Track-Track-Island Platform-Track-Track-Side Platform that doesn't allow cross-platform transfers between express and local trains that is only shared with the two 34 St-Penn Station stations on the IND 8th Avenue Line (A,C,E), and IRT 7th Avenue Line (1,2,3). 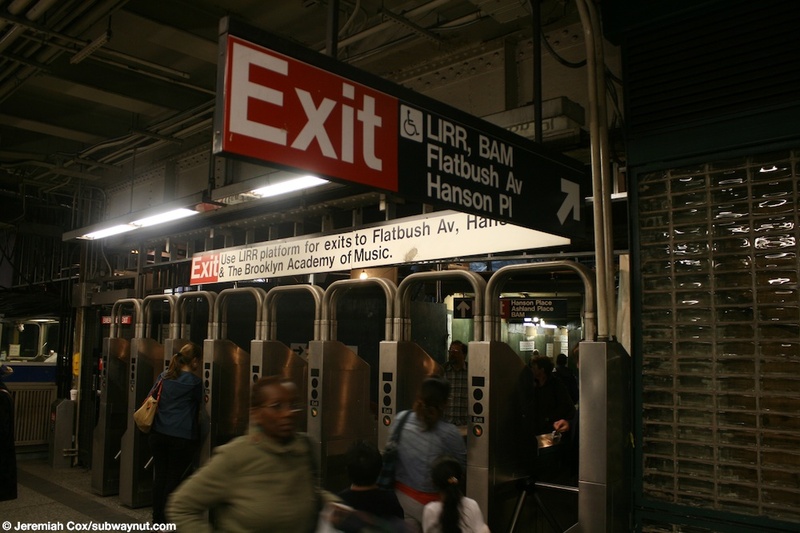 The side platform for Manhattan-bound, local 2 and 3 trains has the main bank of turnstiles and fully staffed exit for BAM, the LIRR, and Flatbush Avenue along it, towards the middle of the platform. This exit is also one of two that is wheelchair accessible. The wheelchair exit here is through the LIRR station. There is also a very wide staircase and narrower one down to the mezzanine level beneath it. This platform is right next to LIRR tracks 5 and 6, and the headlights of LIRR trains on track 6 can be viewed through the modern semi-translucent squares of glass wall that has been built between this platform and the LIRR station. 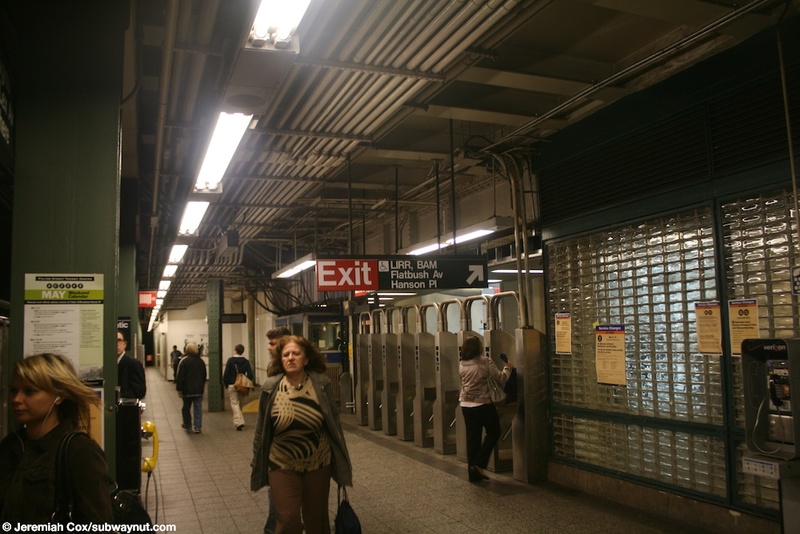 The Express Island platform is a simple narrow island platform with two staircases and its own elevator down to the lower, mezzanine level beneath the tracks. 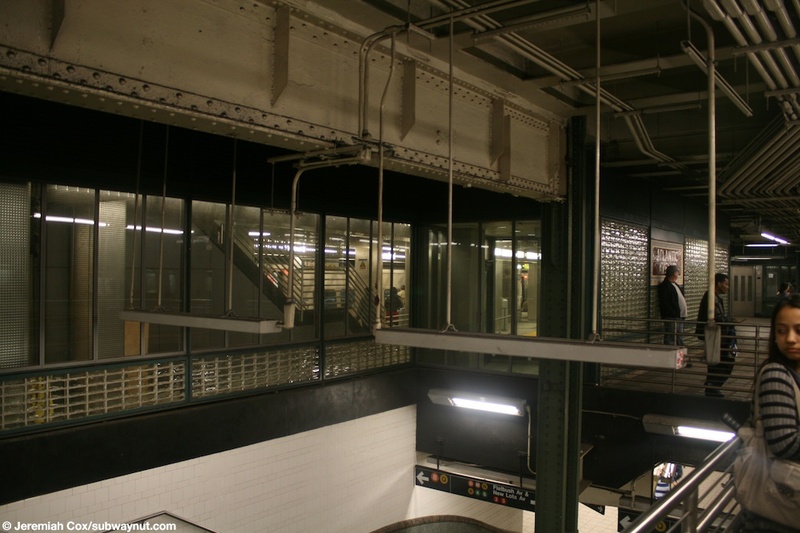 The Flatbush/New Lots-bound Local side platform has no exit directly on it, simple its own elevator and two staircases down to the lower-main mezzanine level. 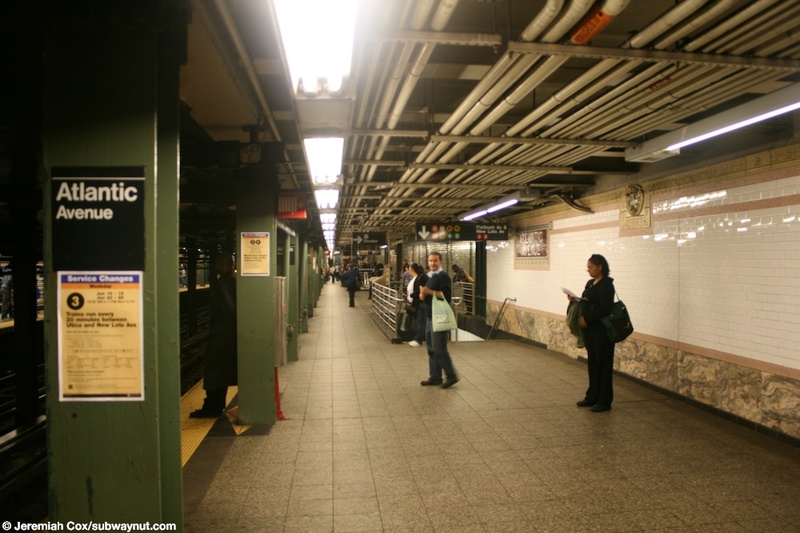 The main central passageway that connects this portion of the station to Pacific Street (and the lower-level mezzanine ends at an extremely wide staircase to continue up) is at almost the same level (there is a short ramp with a tiny bit of a downgrade) as this platform. 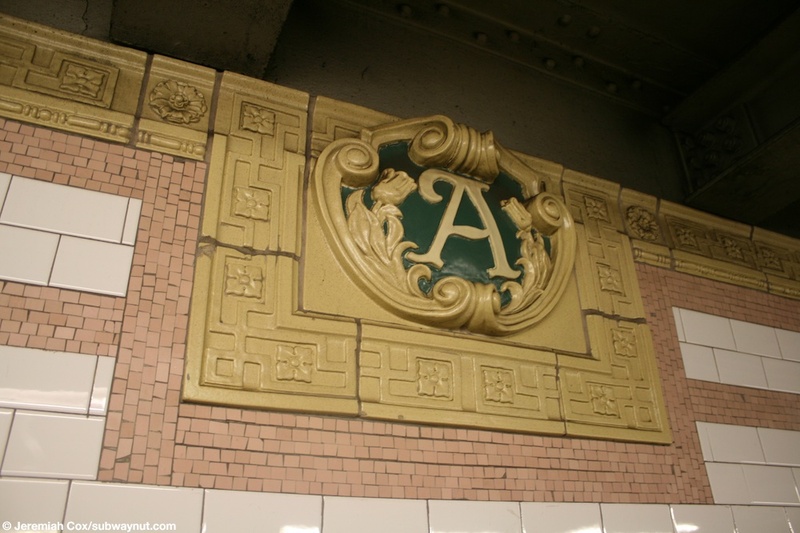 For decorations each side platform has restored mosaic Atlantic Avenue name tablets and towards the middle of the platforms terra-cotta reliefs of an A with a two flowers around it, and terra-cotta reliefs forming the trim-line. 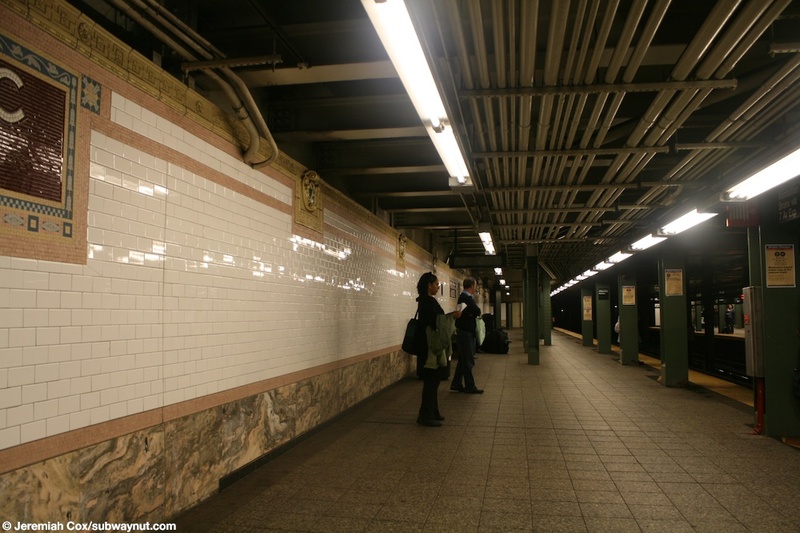 This is all typical of Heins & LaFarge era subway stations, since this stop opened in 1908. Towards the ends of the side platforms where they were extended, mosaic replaces the terra-cotta for the trim-line, and the terra-cotta A reliefs are copied but as flat mosaics. 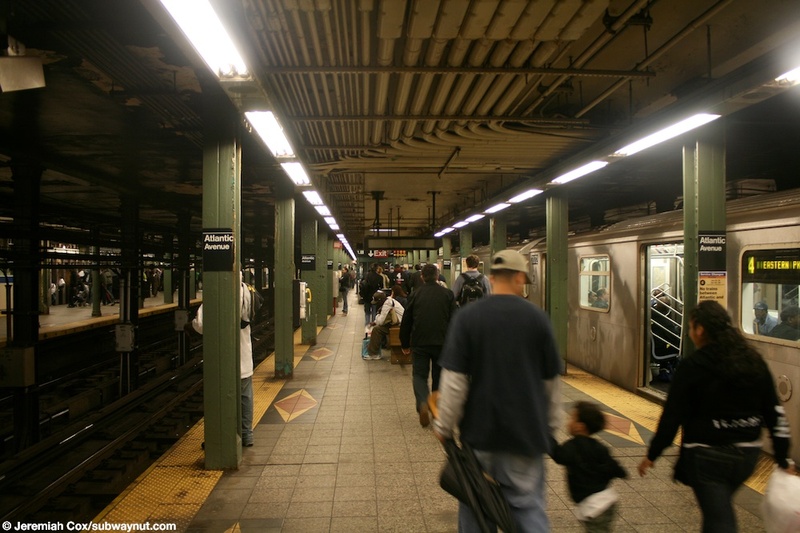 Each track has a set of green columns along them; these vary from the older round design to more modern, standard I-beam design. 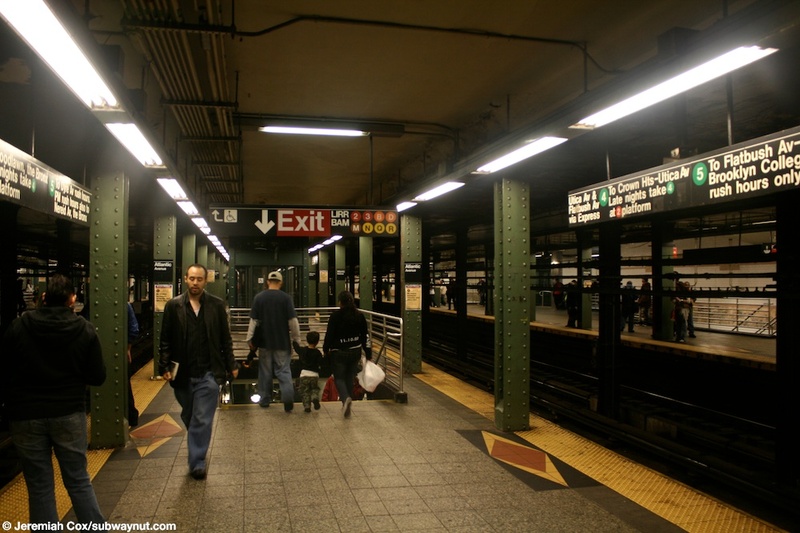 At the extreme eastern end of all the platforms are signs for an emergency exit that leads to what looks like an additional underground passageway. 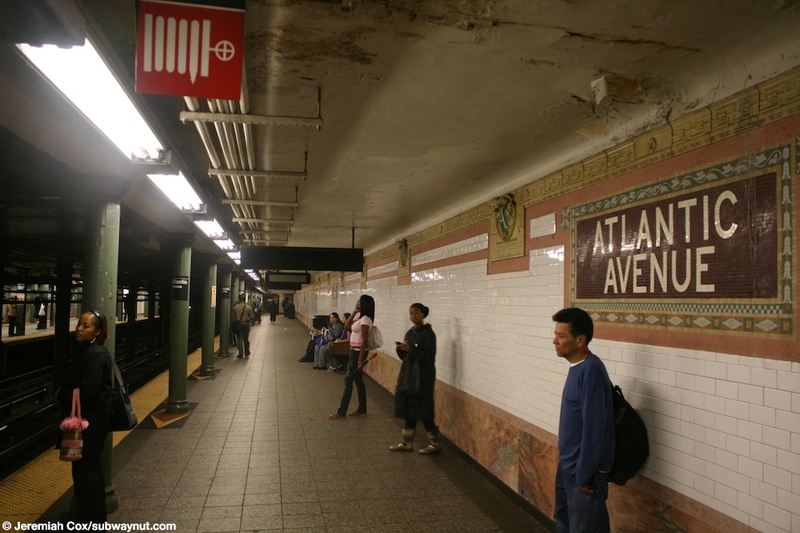 (atlanticn21) Looking down the narrow 4,5 express island platform at Atlantic Avenue. 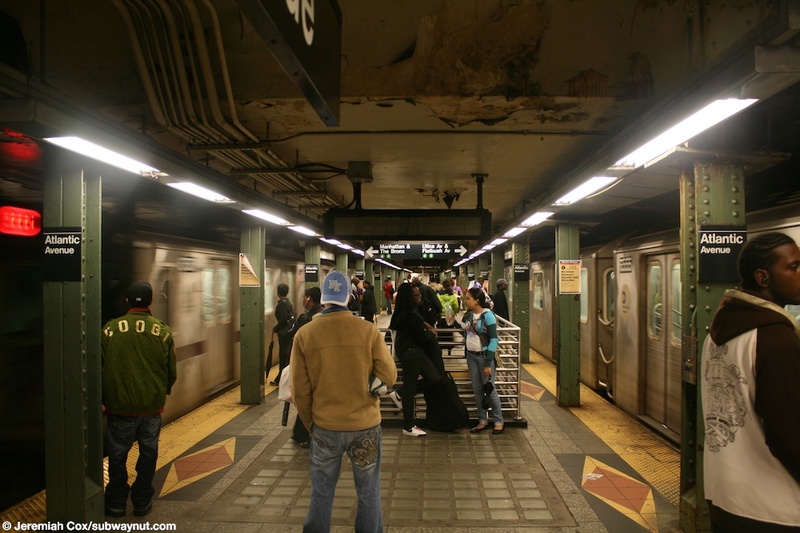 18 June, 2009 (atlanticn22) Approaching one of the pairs of staircases down to the lower-mezzanine level from the 4,5 express island platform at Atlantic Avenue. 18 June, 2009 (atlanticn23) Looking across to the Manhattan-bound 2,3 local side platforms and the one of the main station exits. 18 June, 2009 (atlanticn24) Another view down the 4,5 express's island platform at Atlantic Avenue with one of the staircases down to the mezzanine level visible. 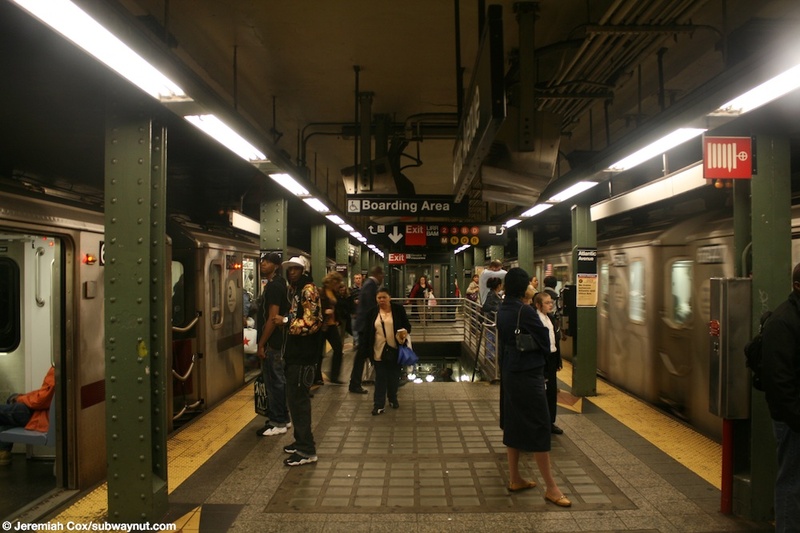 (atlanticn25) The wheelchair boarding area is right at the conductors position on the 4,5 Express's island platform at Atlantic Avenue. 18 June, 2009 (atlanticn26) Looking down the quite wide Manhattan-bound 2,3 side platform at Atlantic Avenue, beyond the staircase and exit area. 18 June, 2009 (atlanticn27) A Atlantic Avenue name tablet on the 2,3 Manhattan-bound side platform. 18 June, 2009 (atlanticn28) A terra-cotta A in the Atlantic Avenue platform trim on the 2,3 Manhattan-bound side platform. 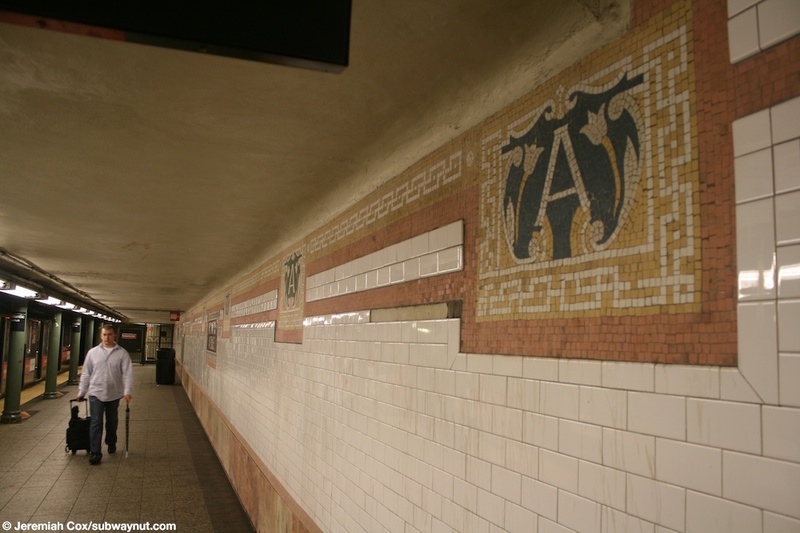 (atlanticn29) Looking down the 2,3 Manhattan-bound side platform at Atlantic Avenue, the modern glass-wall that separates it from the LIRR Station is visible, in construct to the 1908 decorative terra-cotta reliefs on the walls. 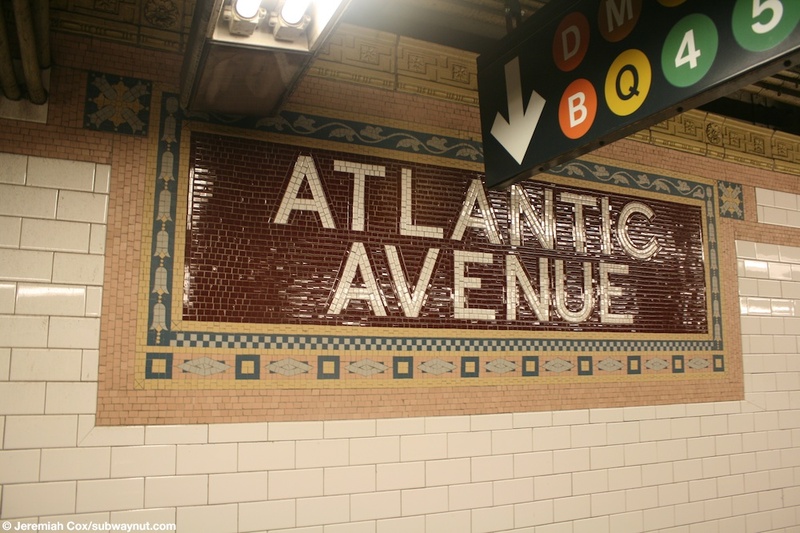 18 June, 2009 (atlanticn210) One Atlantic Avenue mosaic has been installed in the middle of the glass cubes that is a portion of the Manhattan-bound local platform's wall. 18 June, 2009 (atlanticn211) A window looking into the LIRR station from the Manhattan-bound platform at Atlantic Avenue. 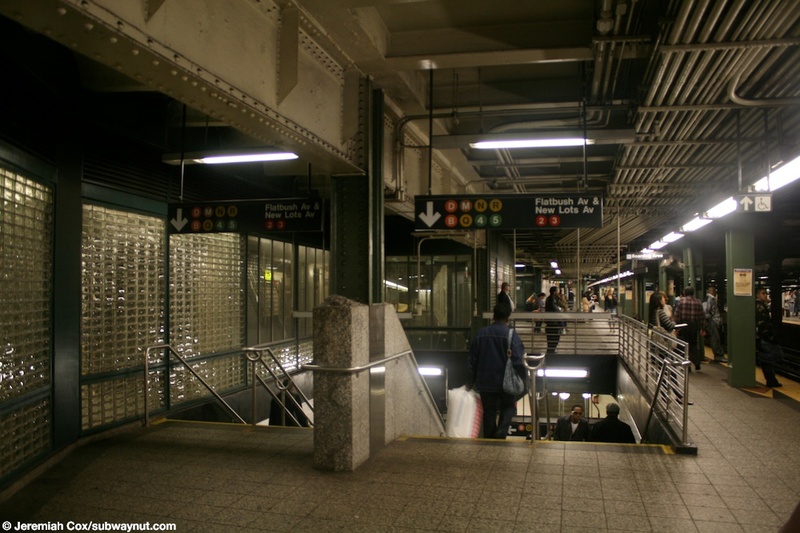 (atlanticn213) The top of the double-wide staircase down to the lower-mezzanine from the 2,3 Manhattan-bound side platform at Atlantic Avenue. 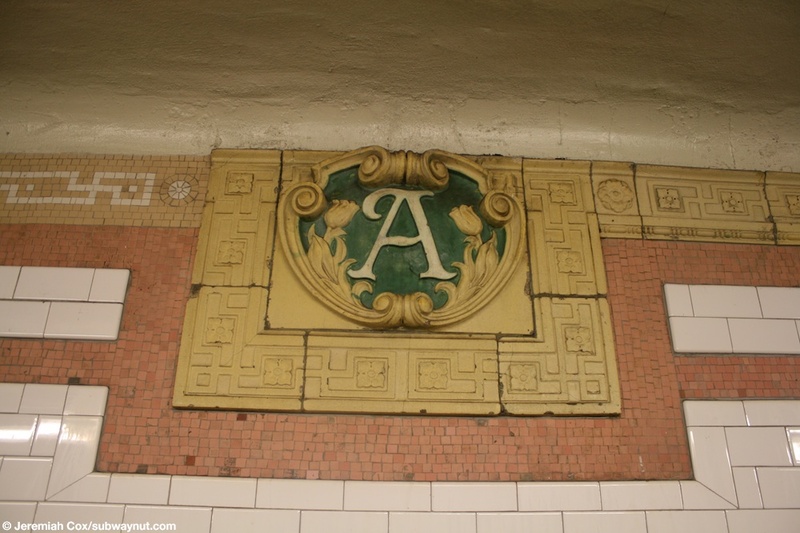 18 June, 2009 (atlanticn214) Looking down the narrow Flatbush/New Lots-bound 2,3 side platform at Atlantic Avenue with the restored traditional 1908 terra-cotta trim, and mosaic name tablets visible. 18 June, 2009 (atlanticn215) A close-up of an intricate terra-cotta A in the terra-cotta trim at Atlantic Avenue, right before the extended portion of the platform begins, where mosaics try and replicate the complex terra-cotta trim. 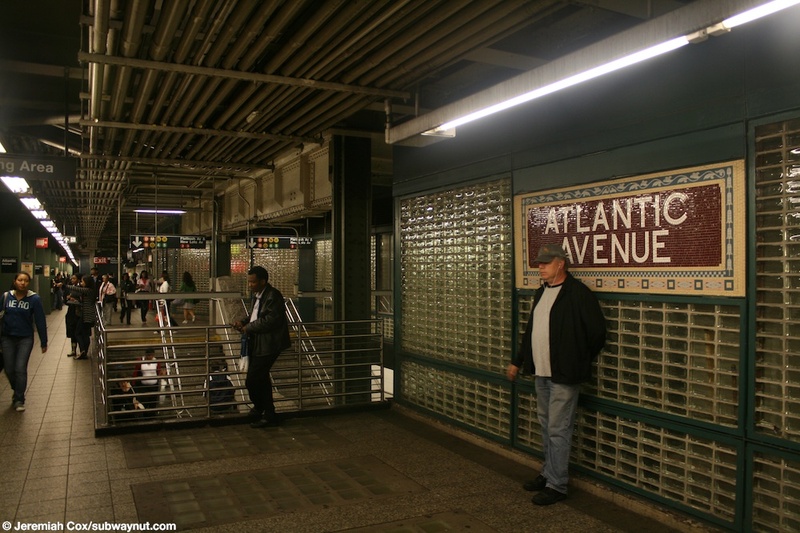 18 June, 2009 (atlanticn216) Approaching the front (eastern) end of the New Lots/Flatbush-bound platform at Atlantic Avenue, with the mosaic A replicas of the terra-cotta that exists in the older portion of the station. 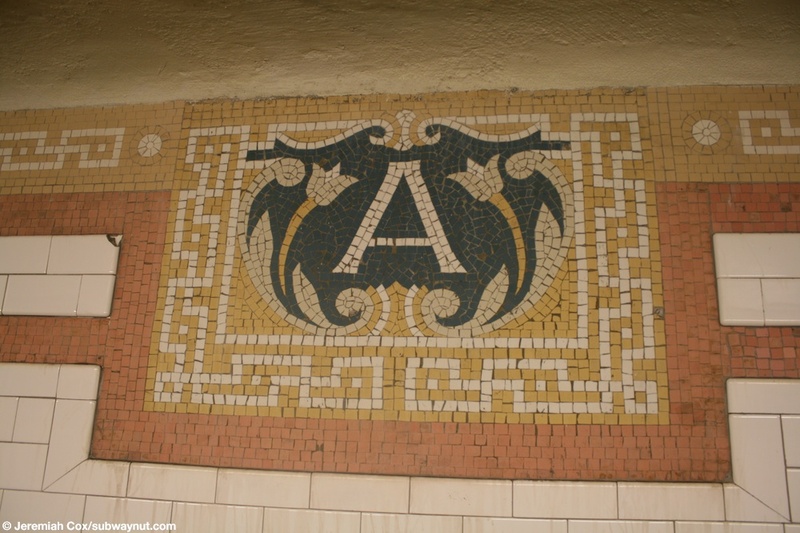 (atlanticn217) A mosaic replica in the extension portion of the Brooklyn-bound platform at Atlantic Avenue of the A surrounded by flowers. 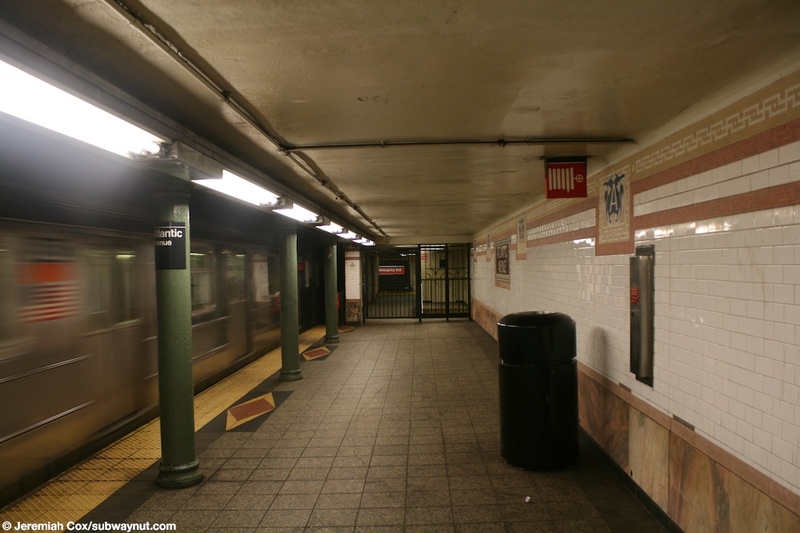 18 June, 2009 (atlanticn218) Approaching the eastern end of the Brooklyn-bound 2,3 platform at Atlantic Avenue where there is an emergency exit. 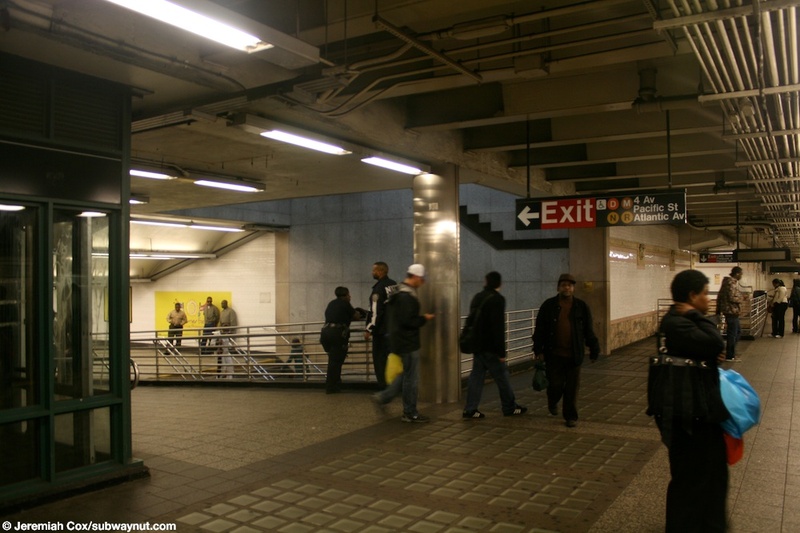 18 June, 2009 (atlanticn219) The ramp that leads down a slight amount to the upper passageway level and to Pacific Street and the 4th Avenue Subway from the New Lots/Flatbush-bound 2,3 platform. 18 June, 2009 (atlanticn220) The main bank of turnstiles and entrance to the LIRR Atlantic Terminal Station, to it's ticket window and waiting room in the grand rotunda from the Manhattan-bound platform.